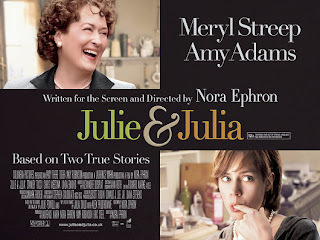 This latest film from American director Nora Ephron (‘When Harry Met Sally…’, ‘Sleepless in Seatle’) is an adaptation of the autobiographical book 'Julie & Julia: 365 Days, 524 Recipes, 1 Tiny Apartment Kitchen' by author Julia Powell. It sees Amy Adams as an amateur chef who adopts chef Julia Child (played by Meryl Streep) as her cookery guru and duly keeps a blog of the results. And you can’t have a movie about Julia Child without food - and not just any food, but the savoury French cuisine that turned American palates away from tuna casseroles in the 1960s. Here are rich, bubbling crocks of winey beef bourguignon, mountainous heaps of chopped onions, trussed ducks and, most magnificently, a browned sole meunière that practically swims off the screen on a buttery tide.